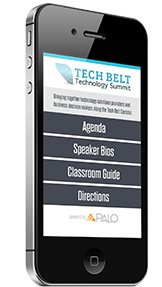 The Youngstown/Warren Regional Chamber in partnership with Data Recovery Services, the area’s leading technology consulting firm, are excited to announce the second annual Tech Belt Technology Summit. The all-day event will provide select vendors and IT solutions provider companies an opportunity to present their latest technology and solutions to a group of over 200 northeast Ohio and western Pennsylvania business decision makers. The day will include break-out sessions that focus on today’s leading technology challenges. Business leaders will be able to learn about which technology solutions will most benefit their companies and how to implement those solutions. They will also get the opportunity to talk with leading vendors such as HP, Cisco and EMC as well as test the latest offerings from regional vendors. Parking is available in the M-1 lot on Wick Ave. and the Administrative lot on Wood St. A shuttle is available at the M-1 lot or you can walk. There will be parking signs located at both lots.